Dr. Rodrigo Guerrero used scientific detective work to determine the factors driving violence, the number-one cause of early death and disability in Colombia. 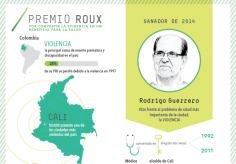 El Dr. Rodrigo Guerrero usó trabajo científico detectivesco para determinar los factores que desencadenaban la violencia, la principal causa de muerte prematura y discapacidad en Colombia. 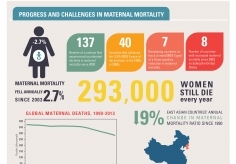 Child deaths cut nearly in half since 1990, maternal deaths by almost a quarter. 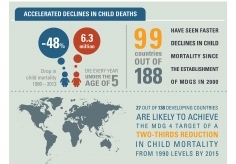 Pace accelerated after Millennium Development Goals were set, yet few countries on track to meet ambitious targets. 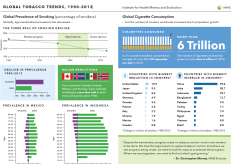 Globally, smoking prevalence — the percentage of the population that smokes every day — has decreased, but the number of cigarette smokers worldwide has increased due to population growth. 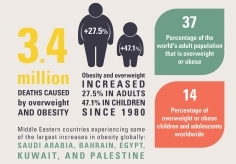 Countries in the Arab world – from Saudi Arabia to Mauritania to Yemen – have made some significant health gains over the past two decades, including increases in life expectancy and swift reductions in child mortality. What ails you isn't necessarily what kills you. While the world has done a tremendous job battling fatal illnesses - especially from infectious diseases - we are now living with more health problems that cause a lot of pain, impair our mobility, and prevent us from seeing, hearing, and thinking clearly. 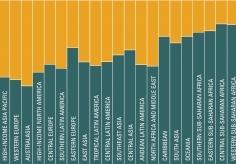 Globally, no matter how old a person is, life expectancy is increasing. 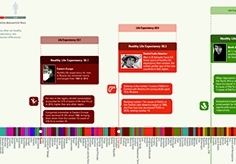 Life expectancy at birth increased 10.7 years for males and 12.6 years for females from 1970 to 2010. 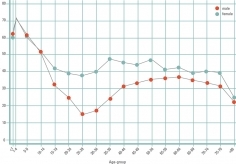 That's because mortality is decreasing in every age bracket, although it is decreasing more slowly among young adults. 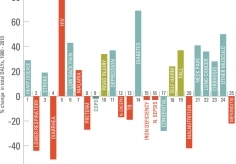 From left to right, you can see the top 25 causes ranked by total DALYs worldwide. The Size of the bars up or down reflects the percent changes from 1990 to 2010. 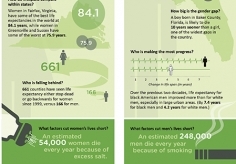 IHME's county-by-county estimates of life expectancy released in April 2012 show that women’s lifespans are improving at a much slower pace than men's nationwide. 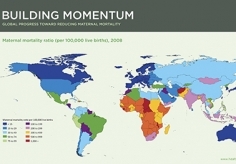 IHME’s policy report The Challenge Ahead: Progress and Setbacks in Breast and Cervical Cancer shows that the risk of dying from cervical cancer fell in nearly every country from 1980 to 2010, because deaths from cervical cancer are not increasing as quickly as population growth. 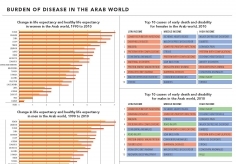 IHME's policy report The Challenge Ahead: Progress and Setbacks in Breast and Cervical Cancer, published in 2011, shows the number of cases and deaths from breast and cervical cancer are rising in most countries, especially in the developing world, where more women are dying at younger ages. 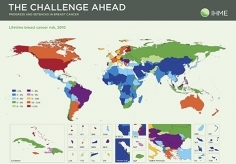 Globally, the chance that a woman would develop breast cancer during her lifetime was 5.5% in 2010, as shown in IHME’s policy report The Challenge Ahead: Progress and Setbacks in Breast and Cervical Cancer. Updated data from IHME's policy report Building Momentum: Global Progress Toward Reducing Maternal and Child Mortality show that across all regions of the world, child mortality rates are declining. 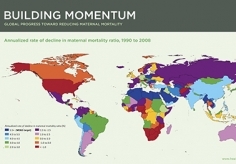 IHME's policy report Building Momentum: Global Progress Toward Reducing Maternal and Child Mortality shows that since 1990, the annualized rate of decline in the maternal mortality ratio has been 1.3%, but rates of change in the maternal mortality ratio vary widely across countries. 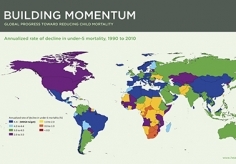 Updated data from IHME's policy report Building Momentum: Global Progress Toward Reducing Maternal and Child Mortality show that the regions with the highest under-5 mortality rate are concentrated in the developing world.